Seen these in Poundland. 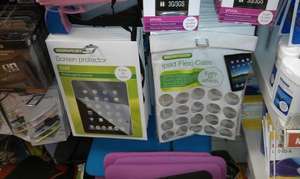 iPad screen protector and also next to it was an iPad Flex Case (description states 'cushions and protects so looks like a diff type of protector). I think they would also fit the iPad-2 however you might need to 'punch' a little hole so that it doesnt cover the front camera on the iPad2, if you're not fussed about the front camera then I believe these would also fit the iPad2 no probs. On a separate note, dont know if you can see the pic at the bottom but they also had neoprene cases for netbooks and laptops all at £1. They were the same product as I paid £6 for a while back for my netbook so looks like good stuff. screen protectors are absolute rubbish - impossible to apply bubble free. I tried two and both went in the bin. I have applied numerous screen protectors to loads of devices in the past but this one is easily the worst! Bought some Signalex screen protectors recently, and I'd swear that the back/front labels were the wrong way round. i use the flexi case not bad for £1. but i suppose for a couple of quid its worth a go, but you're probally just going to be filling your bin. I picked up a flex case, its not a perfect fit but it protects it until I find a better one. These things are under 10p in China, Poundland will probably make 90% profit. I picked up two screen protectors yesterday. Applied the first one and was left with a few bubbles. Now even though i was left with a few bubbles, using the little cardboard piece included i managed to get rid of every single one. Never managed this on a device before. Well worth the £1 if you ask me, just be careful. Also picked up the "jelly" style cover till my replacement arrives. Snug but you will struggle a little to get all the cutaways alligned perfectly. Good enough for a week or so though. In regards to the neoprene sleeves, dont even bother trying to fit the ipad in if you have even a slightly thicker case already on it. Not happening. No way Jose.